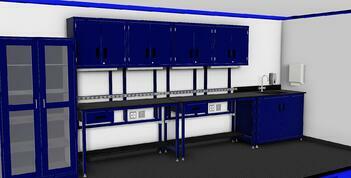 DropBox Inc. manufactures both standard and custom mobile laboratories for general chemistry concerns and use. Because we build our shipping container modifications, almost any size requirement can be met with a single unit or by building multiple modules into one larger complex. The engineering, design, manufacturing, delivery and setup of one of our units can, in most cases, be completed more quickly than traditional stick built structures. By building our units to be delivered turn-key and ready to hook to electric and water/waste lines, we allow our customers to be "up and running" in a fraction of time compared to traditional options. With manufacturing facilities in Worthington and Wurtland, Kentucky, DropBox Inc. realizes the need for both temporary and permanent modular labs that can be used in one location for a time, and then easily relocated to another location for continued use. 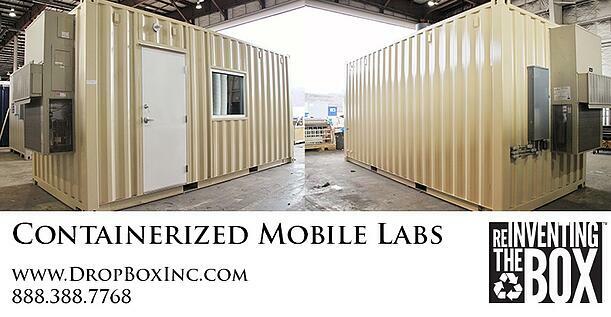 Built from the base that is the long-lasting, durable shipping container combined with quality materials, DropBox Inc. can quickly and cost-effectively deliver a mobile lab for our customers anywhere in the world. Through years of research, engineering, and design, DropBox Inc. has been able to take advantage of lessons learned in shipping container modification and build superb products in a timely manner. 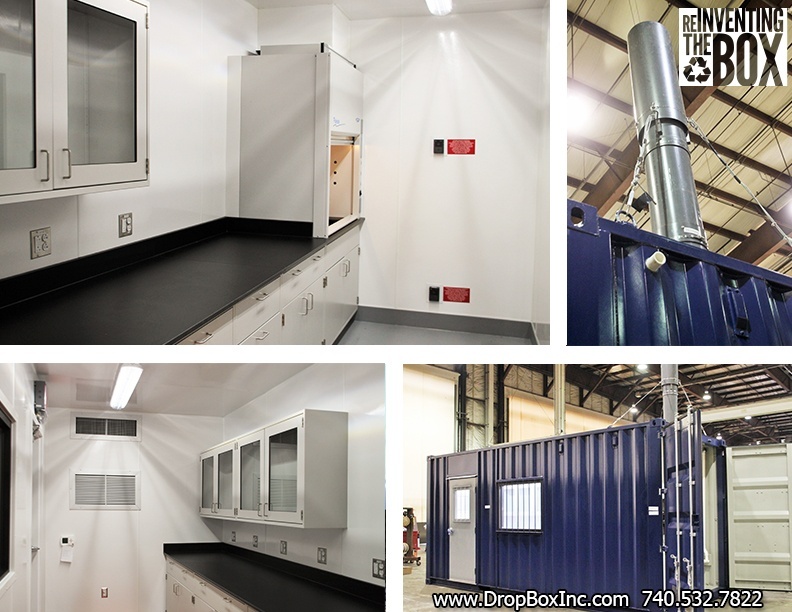 DropBox Inc. has developed several standard lab designs that meet a wide range of laboratory needs for either dry or wet work conditions. Our turn-key laboratories are available with storage space, counter space, fume hoods, sinks, insulation, ventilation, climate control, windows, doors, and much much more upon request. The turn-key units we deliver are perfect for all areas of general chemistry. If you need a larger laboratory than our standard 20' x 8' lab, our design team can work closely with you to engineer, design, and manufacture a custom modular laboratory specifically to meet your specific size and functional needs. We have worked with customers in a wide range of industries to develop custom mobile labs that are currently in use at many different types of locations all around the world. 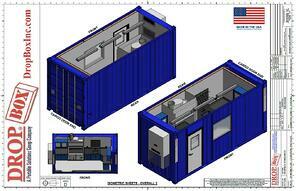 DropBox Inc. utilizes our extensive knowledge in engineering, design, and manufacturing to fulfill all of our customers’ shipping container modification needs from day one. For more information on DropBox Inc. and all of our ISO shipping container modifications CONTACT US HERE or call us toll free at 888.388.7768. At DropBox Inc. we have taken great steps in providing our customers with the right shipping container modifications that are designed and engineered to meet their site specific work related needs. In an effort to meet the demands of our customers with modular laboratory needs we have worked extensively to build customized Mobile Labs for both dry and wet work. 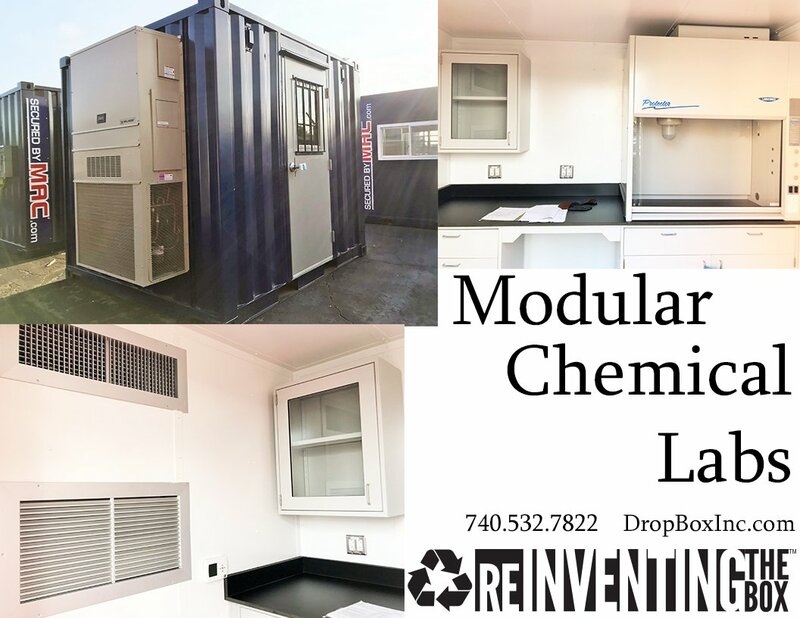 In this weeks edition of the Shipping Container Mods Blog we will be taking a look at our custom line of Mobile Labs compete with product descriptions and specifications. 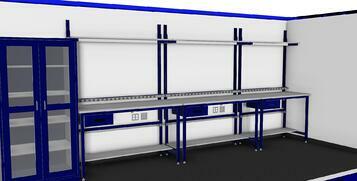 8'-0" X 20'-0" X 8'-6" standard height container utilized for a mobile lab with dry workstations. Interior furnishings include one (1) 36"W steel storage cabinet, two (2) 60"W steel frame workstations with electrostatic discharge (ESD) work surface, and one (1) 48"W steel frame workstation with electrostatic discharge (ESD) work surface. Systems service location is utility room. Systems include electric and communications. 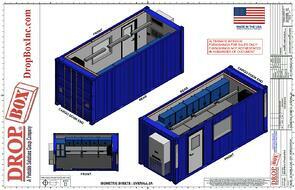 8'-0" x 20'-0" x 9'-6" high cube container utilized for a mobile lab with casework. Interior furnishings include 24' of base cabinets and epoxy counters, 7.5' of wall cabinets, epoxy pegboard, and epoxy sink. Systems service location is utility room. Systems include electric and plumbing. 8'-0" x 20'-0" x 9'-6" high cube container utilized for a mobile lab with casework and laboratory hood. Interior furnishings include 19' of base cabinets and epoxy counters, 7.5' of wall cabinets, epoxy pegboard, epoxy sink, and 5' lab hood with built-in blower. Systems service location is utility room. Systems include electric and plumbing. (1) laboratory fume hood vent discharge connection on roof. Additional options available option including zero-pressure cap. 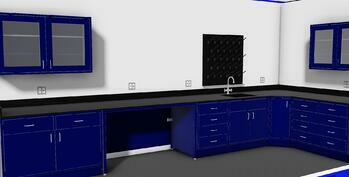 (1) 5’ laboratory fume hood with built-in blower. 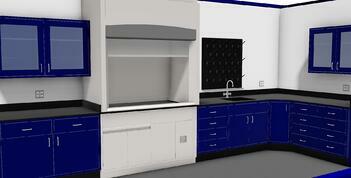 Lab hood is not Z9.5 compliant; external blower option required. Spill protector surface with cup sink. 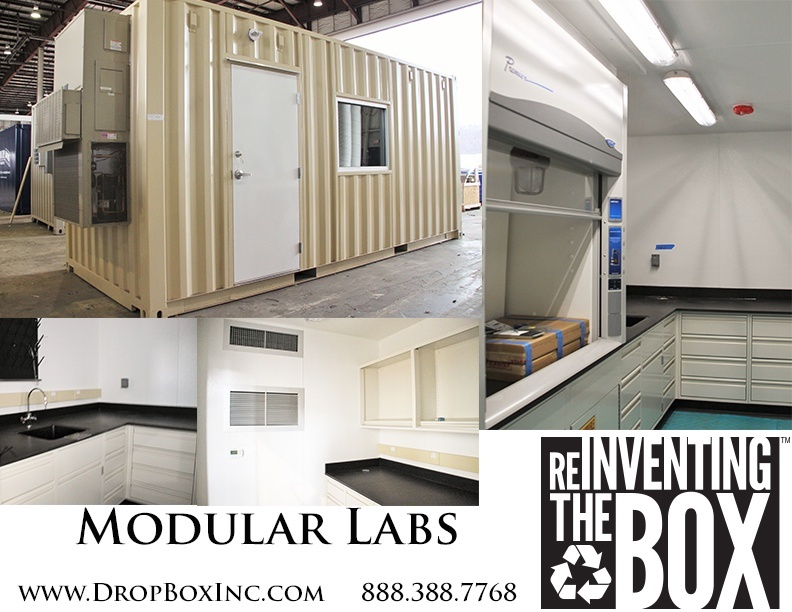 For more information and pricing on our Mobile Labs CONTACT US HERE or Call Us toll free at 888.388.7768. 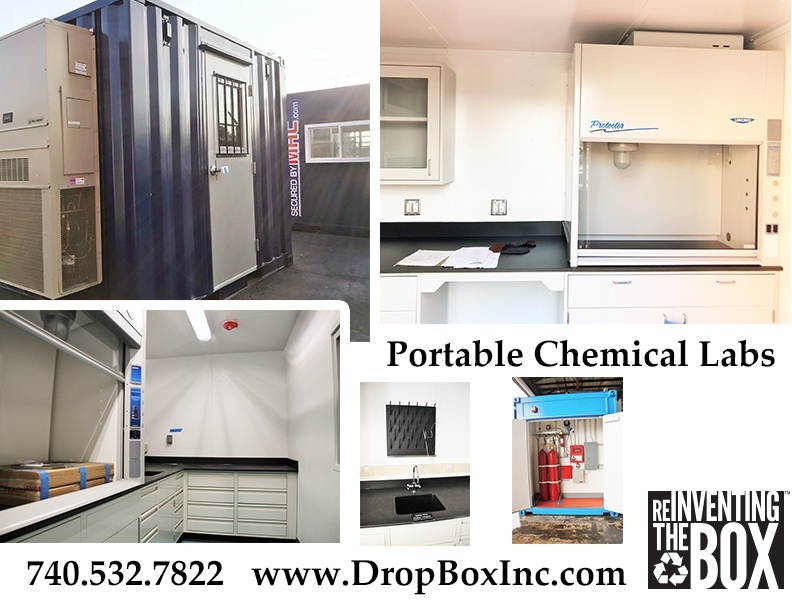 DropBox Inc. uses ISO shipping containers, milvan, conex boxes, and sea cans to build custom portable solutions for chemical storage and containerized chemical laboratories. DropBox Inc. is a Custom ISO Shipping Container Modification Company with years of experience in custom shipping container modification designs, engineering, and manufacturing. We can obtain certifications for Shipping Container Modifications and modular structures in all 50 States as well as Canada. DropBox Inc. takes milvan, connex boxes, sea cans, and ISO shipping containers that would typically end up going unused in ports around the U.S. and modifies them into a wide range of portable site solutions. DropBox, Inc. has a history serving a wide range of needs for industrial construction companies, the Military and commercial contractors with products that meet customer needs. We have become the one-stop shop for project managers, procurement professionals, and end users when it comes to furnishing their jobsites, plants, and man camps, with portable, containerized site solutions. 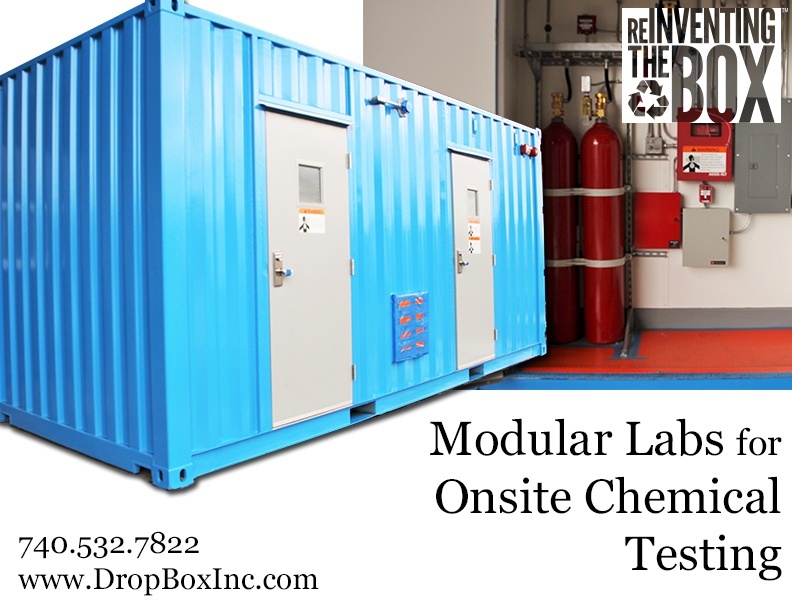 modifications like these fire rated modular chemical storage containers that have been equipped with secondary containment flooring, fire suppression, and alarm capabilities. Additional hazardous chemical placards, safety signage, and custom sizes make these containerized chemical storage modules the perfect solution for on site storage of hazardous chemicals like pesticides, paints, solvents, and other harmful agents. These havardous chem storage modules from DropBox Inc. can also come equipped with climated control and additional features based on our customers needs. With a short lead-time of 4-6 weeks these units can be manufactured and delivered in a short amount of time from the date of purchase. 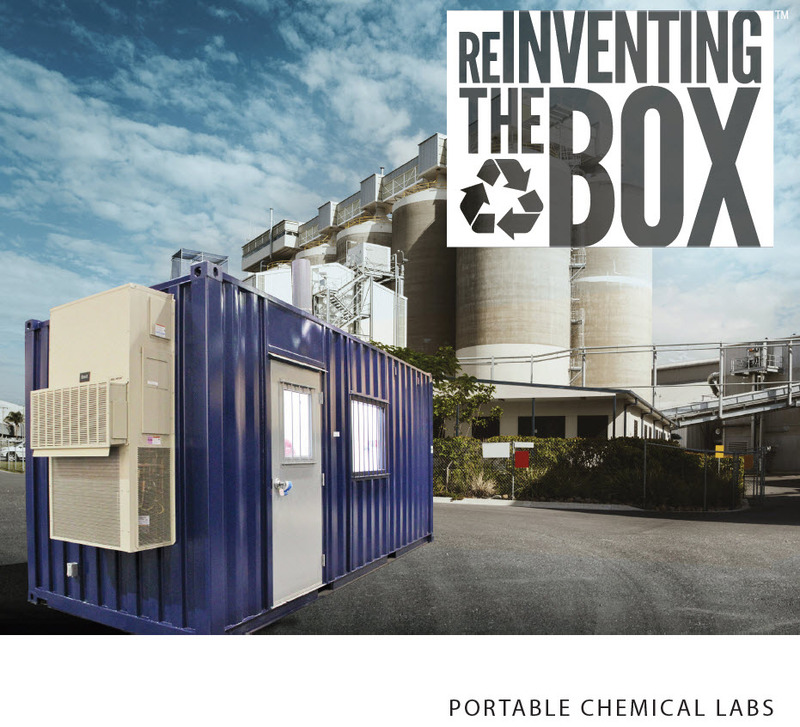 These mobile chemical labs built by DropBox Inc. are also perfect for temporary installations and remote locations. Designed expressly for chemical laboratory use with high end interior finishes and mechanical systems these modular laboratories are guaranteed to meet the demands of the chemical industry standards. 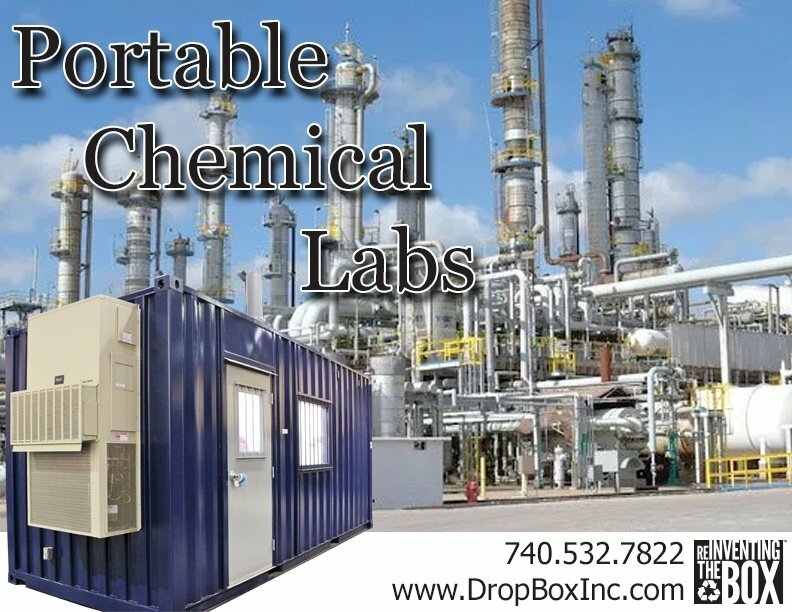 For more information on DropBox Inc. and all of our Chemical Storage and Portable Labs CONTACT US HERE or call us toll free at 888.388.7768.